EZRentOut’s equipment rental software enhances your business decisions by helping you make sense of complex asset management data. Using our in-depth reports and analytics, you can understand financial trends, maintenance needs, and rental volume. Our online rental software also helps you schedule a conflict-free reservation, and to tweak and filter report data to get exactly the information you need. 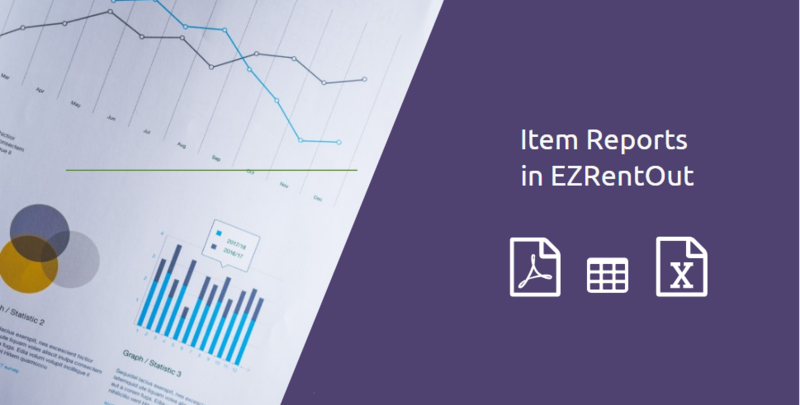 Item reports in EZRentOut can help you optimize equipment performance by detailing information about item utilization, events, and quantities. With so many reports to choose from, you have a way to bookmark your favorite reports for added convenience. Do this by clicking the star icon on the report details page, and view all your bookmarked reports in one place. Let’s take a look at the kind of item reports you can create, and how they’ll help you add value to your rental business. Available Assets: List all available assets. This list can be filtered by group, vendor, date of creation and stock location. Example: ‘Detail the number of assets available from the group ‘Digital Equipment’ and the subgroup ‘Hand-Held Devices’. Checked Out Assets: Shows assets that have been rented out currently, or were rented out during a specified set of dates. Example: ‘How much of our tracked equipment was checked out between the first and fifteenth of March?’. Checkin / Checkout Events: Details the major rent-out, return, and transfer data relating to all or some assets, depending on your preferences. Example: ‘Identify the trends of transferring assets between each of our three locations’. Overdue Assets: Lists assets that have not been returned on time. You may even pull up the rental history of specific users. Example: ‘Show how many assets Ronan Strang returned late’. Retired Assets: Gives a description of all assets that have been retired, including the reasons for retiring them, and the salvage value (if any). Example: ‘How much did we get for our retired excavators last month?’. All Active Assets: Lists all active assets owned by the business. This includes vendor, location, status, and group filters. Example: ‘How many of our dry vans are under maintenance currently?’. Asset Scans: Details a list of all the asset scans that have been done, and can be sorted on the basis of their location, the date of scanning, the scanner, or the groups or subgroups that were scanned. Example: ‘Show me the scanning history of John Smith with reference to forklifts’. Asset Geo-Location: Works with the scanning function and draws up a chart detailing where assets or groups of assets are located. Example: ‘Where is all our surgical equipment located currently?’. Report filters let you choose the information you want your report to show. Asset Utilization: Lists the frequency of rentals and the rental duration of assets, and can even be sorted according to location. Example: ‘How much AV Equipment belonging to the subgroup ‘Video’ was checked out in the Annapolis office in the last six months?’. Depreciation: Allows you to see the depreciated value of your assets, as well as figures denoting depreciation per month. Example: ‘What is the depreciated value of all surgical equipment logged in on January, 2012’. Summary: Lists all assets or groups of assets that are overdue, rented out or available. You can sort these by quantity. Example: ‘Show if ≤ 20 ventilators are available’. Asset Aggregate Quantity: Allows you to group assets together by location, group, vendor, or more. Example: ‘Show the number of goods vehicles located in the Backbee Warehouse’. All Inventory: See a list of your inventory, broken down by current location. This list can be filtered by group, vendor and stock location. Example: ‘Show the details of all items provided by Weirhause Ltd. in the Electronics group’. Line Items: This provides a list of all inventory line items broken down by individual action. Example: ‘Show me all instances of stocks of stationery added, sold, or moved in Baltimore’. The Stock Summary Report shows you net quantities of all your inventory. Stock Summary: This shows you net quantities of inventory within a particular timeframe. Example: ‘Show me the net quantity of containers at the end of last month’. Low Stock: Show which inventory items have reached their low stock threshold or location threshold. Example: ‘Which of the inventory items procured from Carlisle Inc. need to be reordered?’. All Asset Stock: See a list of your asset stock, broken down by current location. This list can be filtered by group, vendor and stock location. Example: ‘Show the details of all asset stock provided by Equip-Fix in the Power Tools group’. Stock History: See all the actions taken on a particular asset stock in a specific timeframe. Example: ‘Show me the event history for the Furniture group in the last quarter’. Checkout Events: Lists all checkin/checkout events filtered by member, group, and vendor. Example: ‘Show me all instances of cables being checked out by Peter Yen in the last month’. Stock Utilization: Shows the total rental duration of asset stock broken down by location. Example: ‘Show the number of hours outdoor lights provided by Equip-Fix were used last week’. Current Checkouts: Shows all currently rented out asset stock, its custodians, and the location they have been rented out to. This can be changed to show rentals within a specific timeframe. Example: ‘Show me all the asset stock checkouts Bo Riley has currently made in Baltimore’. This entry was posted in [Support], Reporting by admin. Bookmark the permalink.